Before finding tenants for your property, you will have to decide on a pet policy. There are negatives to pets, such as the ability to cause damage to your property, but there are also positives to pets, including responsible pet owners being great tenants. Learn the pros and five cons of renting to tenants with pets. 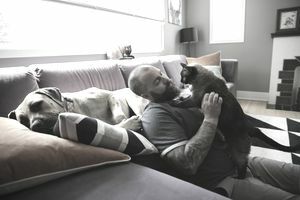 Larger Prospective Tenant Pool: Firepaw.org states that almost 50% of renters own a pet. Therefore, if you make your property pet-friendly tenant as you will have a larger group to choose from. Sneaking In Pets: If you allow pets, it will decrease the chances of tenants trying to sneak in pets that you have not approved. Damage to Your Apartment: Animals can scratch the floors, chew up carpets and have accidents on the carpets or wood floors. Loss of Other Tenants: Other tenants may be allergic to dogs or cats. Tenants may move when an animal becomes disruptive. Yes, there is a Fair Housing Law regarding pets. Even if you have a no pets policy, you cannot violate the housing rights for the disabled who require an animal for their well-being. You can ask for a note from their physician verifying their need for an assistance animal. You will want to check your insurance policy to find out what type of coverage you have if you decide to have a pet-friendly property. Make sure you know the amount of liability coverage your policy includes. Ask your insurance company if there are any limitations or exclusions to this coverage, such as if they have a list of dog breeds they consider to be "dangerous breeds," which will not be covered under the policy.